“Dad is rejoicing in heaven.” Those were the words my sister said when she called last evening. On Thursday, June 27th at 4:15 pm, my father received the upward call. We have all shed tears, but are experiencing a strong sense of God’s peace and joy. He finished the race and fought the good fight and kept the faith. In the room where my dad spent his final days, there were two special memory books. The first was small picture album my mom had made—a photo review of my father’s life. It contained black and white pictures of his parents (Louis and Bertha Reed), colour photos of his wife and three kids, snapshots of the homes where he had lived and the churches he had pastored. Mom had typed captions under the pictures, explaining their significance. In the final months of my dad’s life, he spent hours looking at that memory book. Family members and care workers would read it with him. He would stare at the pictures, trying to remember what they represented. Over the months, it became more difficult for him to remember; much of his short-term and long-term memory had been erased by Alzheimer’s. On our recent trip to Portland, there was an evening when dad was awake and alert for several hours. I opened up the memory book and we looked at it together. One page that especially caught his attention contained a glossy, black and white snapshot from the late 1950s. The picture was of my dad and mom, smiling at the camera, holding a baby boy. I don’t think he understood that the child in the picture was now the one reading the book with him. There was another memory book in my dad’s room. This one was filled with handwritten letters of appreciation from the people of Grace Baptist church in Napa, California. Dad served as their pastor for over twenty years. One morning while he was sleeping, I read through dozens of the letters. Some folks thanked him for faithfully teaching them God’s Word, week after week. Many expressed gratitude for the way both he and my mom lived out the truth they taught to others. There were many references to his sense of humor (corny jokes), his devotion to prayer, his hospital and home visits. Some wrote to thank him for helping them work through marriage problems, others for helping them come to know Christ in a personal, life-changing way. Proverbs 10:7 says, “The memory of the righteous will be a blessing but the name of the wicked will rot” (Proverbs 10:7). 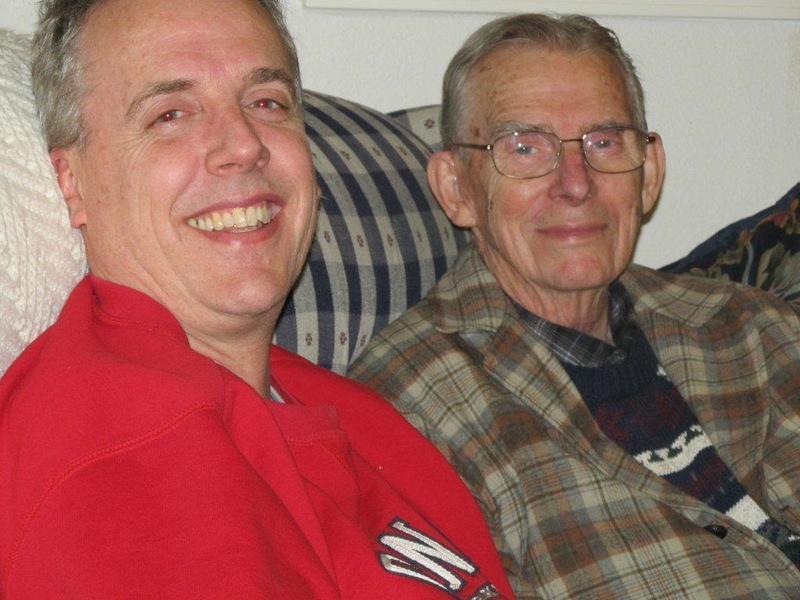 My dad’s memory faded in his final years. But the memories of my dad are a blessing. That’s true for the many who knew him as their pastor. Even more so for those who knew him as a father. Our thoughts & prayers are with you as you travel for this final earthly farewell. Thank you for sharing the news of your dad’s life and passing. I know you will miss him but at the same time rejoice that he is free of his infirmities and is receiving his reward in heaven. We’re carrying on at the Met but still miss you, in spite of the fact that we’ve had some wonderful guest preachers as well as our own. Like many others at the Met, I had the privilege of meeting your Dad on several occasions. Two aspects, among many others, struck me the most. First, he had such a gentle spirit – as soon as I met him I felt warmth in his company. Second, he demonstrated a profound love of the church and of those men who pastored in the church. I extend my best wishes and prayers to you, Linda, Ryan, Michael, Lindsay, your Mom, and all of your extended family – your Dad was irreplaceable, but is now well placed in the company of our Lord. Pastor Rick, Our deepest sympathies to you, Linda, your mom and the rest of your family on the passing of your Dad. I know it is a great comfort to all of you that he is now at rest and rejoicing with the Saviour at this moment and for all eternity and that soon you will see him again. I know that it has been a very long journey for all of you and will be praying that the Lord will provide the needed strength in the coming weeks. Hi Rick (& Linda): one of my fb friends saw you on TV this morning (Sunday, that is), and mentioned the news of your dad’s passing on. I’m sorry for your loss. I trust this time will be full of thanksgiving in the midst of grief for you and your family. I always appreciated your dad’s gracious presence and well-weighted words, the few times I remember him coming to the Met. (Lovely that your mum got to share one more anniversary with him.) Someone in the comment thread mentioned your blog, which I managed to find via Google (after wading through numerous references to your – dare I say? – regrettable namesake, who has a very different idea of what life is about! ); so I’ve signed up. Looking forward to hearing your thoughts. I will pray travelling mercies for you, and a blessed time at your dad’s memorial service. Will you still make it up to MBC? I think our friend Krista may be there (her brother has a trailer there; I know she’s there now). She attended the Met in the 90’s, I think maybe before you came. Anyway, I trust God will bless your time up there – our kids will be going to Pioneer Camp (around the corner from MBC) a bit later in the summer, Lord willing. OK, catch you later.